I am completely in love! I am in head over heals, heart pounding, lightbulb flashing in love with the movie Julie and Julia. I cannot wait to download the book to my kindle and to eat that word by word. Amy Adams in great but Meryl Streep is simply extraordinary. My husband was less than excited when I said I had rented the movie Julie and Julia from the $1 blockbuster machine at Publix. I put it in the DVD player as soon as we got in and luckily did not fast forward past the previews. Jeff went to the computer, plugged in the title, and saw the words Julia and Child, and rushed out to watch. 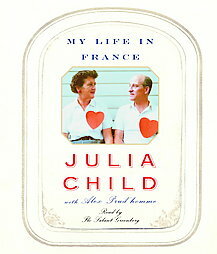 For me, Julia Child is a name, like James Dean or Doris Day. I recognize her name and know why she is famous, but have no real connection to her. But he grew up watching her, idealizing her, with the foundation of his every night masterpiece dinners from her lessons. Of course, with that thought, I am truly grateful to her. I loved watching Meryl Streep’s enthusiasm and learning about what it took for Julia Child to become who we know her as today. I had to blog about this because I too am a non-writer who is working for a government agency feeling like life has not panned out. I too have a hobby/passion for something that is less than understood. I love to knit and began my website to share my ideas and to tackle designing. I’m not a professional, but I enjoy what I do. I only hope that I can be as dedicated as Julia Child or Julie Powell. In the meantime, please bear with me. I will be posting and knitting away. At this time, I am attending classes at FGCU for my second bachelor’s degree in Accounting while working -, attempting to care of a house, a husband, and four cats, and juggling as much as possible. I will be knitting as stress relief of course. I am working on my second sock with Misti Alpaca using their pattern as my guide. I hope to design a shawl when I’m finished with my gorgeous sock!